Thursday 28th February from 12-6:30PM we will be accepting pre-owned designer handbags to buy outright with a three day authentication providing a price offer.A form will be provided which would need to be filled out for payment. Sunday 3rd March is collection only from 12-8pm. RSVP for the location. Take up to 80% discount on women's apparel, bags, accessories, footwear, and homeware at the Sample Sale. Brands included are Chloé, Victoria Beckham, Alexander McQueen, Ganni, Temperely, Rixo, Acne Studios, Marni, Alexander Wang, MiH Jeans, Red Valentino, Isabel Marant, Galvan, Tom Dixon, Helmut Lang, Fornasetti, MSGM, and No.21. 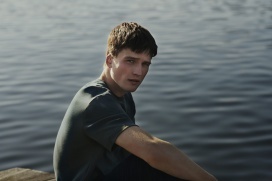 Enjoy up to 70% off on apparel, accessories, and shoes for men and women at Sunspel Sample Sale. Items available include dresses, underwear, loungewear, knitwear, polo shirts, and t-shirts. Cash and card payment are accepted. Enjoy up to 80% savings on men's apparel, accessories, and shoes at the G.H. Bass, E Tautz, The Workers Club, and CMMN SWDN Sample Sale. Price starts at £10. 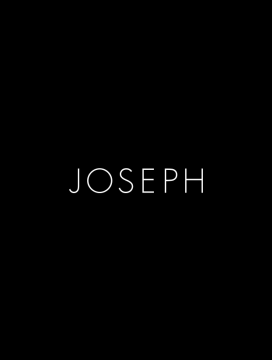 Take up to 80% discount on men and women's apparel, bags, accessories, and footwear at the Joseph Sample Sale. 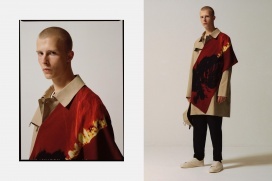 Brands included are Thom Browne, 3.1 Phillip Lim, Peter Pilotto, Alexander Wang, Roland Mouret, Altuzarra, Alexander McQueen, Bottega Veneta, Jacquemus, The Row, Jil Sander, Junya Watanabe, Lanvin, Marni, Giambattista Vallli, Valentino, Maison Martin Margiela, and Vilshenko. Take up to 75% discount on women's apparel and jewellery at the Ekta Solanki and Mara+Elle Sample Sale. 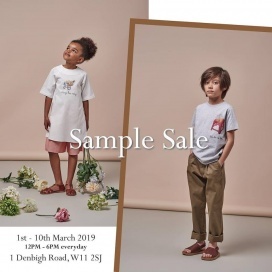 Take up to 75% discount on kids' apparel at the Hannah and Tiff Sample Sale. The Sale will be comprised of one-off samples and previous collections items. 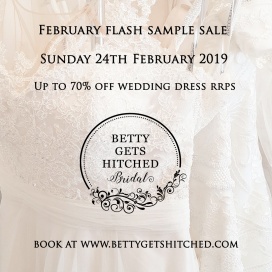 Take up to 80% discount on wedding dresses at the Riki Dalal Haute Couture Sample Sale. Helene Berman will be hosting a Sample Sale featuring coats, jackets, and hats for women at discounted prices. Shop for women's apparel and accessories at reduced prices at the Mulberry Sample Sale. Shop for lingerie at reduced prices at the Attollo Lingerie Sample Sale. Sizes are 28 to 36, S to XL, and D to HH. Take up to 75% discount on women's apparel and accessories at the EAST Warehouse Sale. Items included are dresses, jackets, knits, tunics, blouses, skirts, and trousers. 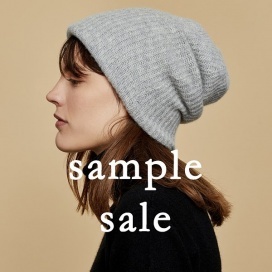 Shop for women's apparel and accessories at reduced prices at the Crumpet Cashmere Sample Sale.